My Thoughts: Oh gosh, we jump right into Sabrina's head and realize she isn't exactly normal. She is diagnosed with schizophrenia and has been taken to the Wellness Center to get better. Sabrina doesn't actually think she's sick. She doesn't really understand why everyone thinks she is even if she does have dreams and sees things differently from the way they really are. In her mind, this is normal. We also experience flashbacks throughout the novel, giving us insight into Sabrina's world. We than meet Alec who is also in the Wellness Center. He's in there for a little different reason than Sabrina. At first you figure he's pretty harmless but than you start to wonder if that is true when you learn more about him. Sabrina and Alec see the world a lot alike. They also feel like everyone else are the different ones and society are the ones that want to conform everyone to be the same. Sabrina and Alec are a good pair, sort of. I'm surprised they didn't try to keep them apart more though. Honestly, I'm not going to say much else about this one. I just wanted to write up a few quick sentences. 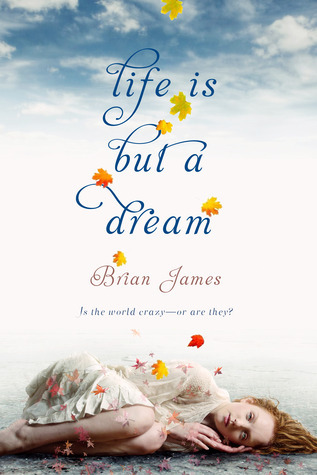 Life Is But A Dream just wasn't the book for me. Probably because its not all rainbows and sunshine. I prefer my romance books to be all about the epic battle to be together and the sweet moments. This book was rough in a few ways. I also felt sorry for Sabrina and I didn't like seeing her struggle with her battle. I didn't like the way the doctors treated her but I do understand why and they were just doing their jobs. Overall: This book was just ok for me. I think if you like the kind of books focusing on illnesses than you'll enjoy it more than me. It was also very very detailed and at times I wanted to skip ahead because I just felt myself not really caring too much. This book was alright but not for me but I did finish it at least. To sum it up, it was just alright, I didn’t hate it, but I also didn’t love it. Hopefully you like it more than me. Cover: Like it. It's very pretty. Like the way the girl is laying. Super excited about this one. The subject matter is very interesting me. I am one that finds psychology super interesting. It sounds really good, but at the same time a bit weird. I'd have to be in a certain mood to read this. Great review, thank you for being honest! I'll have to go see more reviews on this to see if I want to add it to my list or not.